With the popularity of watersports growing, especially in warmer seasons, a lot more people are considering taking up snorkeling or scuba diving as a hobby, widening their perspective vacation spots and offering pleasant, unforgettable experiences. Today, we’ll be focusing on snorkeling and some essential piece of gear that allows safe diving. We’ve compiled a best snorkel mask list so that you find some relevant information regarding the product’s quality before settling on a mask. As we’ll see further in the review, there are some factors (although not many) to take into account when buying a snorkel mask. We’ll be starting with a mini-buying guide to go over some of these factors and why they’re so important. Comfortable fit. It’s pretty redundant but if you’re searching for the best snorkel mask, you’re basically looking for a very comfortable fit. The straps and the shape of the mask itself must perfectly fit your face and keep you comfortable, especially in environments that can get dangerous. If you wear glasses, make sure that you pick something with prescription lenses. Tempered glass. A quality mask will have a tempered glass lens, making it more durable and resistant to damage. Darker lenses will reduce glare, making them ideal for underwater amateur photographers. Full face. Whether or not you go for a seaview full face snorkel mask is up to you, but we find that a full face mask is better for beginners, as it offers a bigger field of view and more comfort. This might be the best full face snorkel mask for beginners. TriMagic is a relatively unknown company in the industry, as they’re mainly producing boomerangs (I know, weird, right? ), but that doesn’t really reflect on the quality of this snorkeling mask. The 180-degree full face design (similar to the one used in the Octobermoon snorkel mask) will offer users a nice diving experience, as your field of vision will be very big. The full face design also removes the requirement of having a snorkel directly in your mouth, allowing you to breathe more naturally and eliminating discomfort. The breathing chamber is also separate from your main visor so that you won’t be getting any fogging. Its design makes it very adjustable to all sizes, even kids, which is one of the best features of this snorkeling mask. It’s very affordable and packed with features that will give you more comfort and utility – a very great pick for anyone. Cressi is one of the industry leaders when it comes to watersport equipment. They manufacture a large range of products from diving vests to knives, bag, and accessories for divers. The company was founded in 1946, in Italy, and since then it has been responsible for shaping the watersports market. The Cressi Panoramic Wide View Mask is another great product made by the Italian company. With a great tight fit, due to the double feathered edge skirt and the soft, 100% high-quality silicone rubber skirt, it will give you proper support and watertightness, providing a wonderful diving experience. Moreover, the tempered glass lenses are very tough, surviving any type of environmental damage and staying intact for many individual trips. Although it’s great for both kids and adults, you’ll find that people with smaller heads will have trouble fitting it properly, so you might want to compare different sizes in order to achieve best results. Price-wise, it’s around the same of most competitors, although this comes with tempered glass, the best type of material used in these pieces of gear. Another great product from Cressi, this time aimed at people who want a better view. The F1 mask has a Clear Wide view angle because it’s designed using just one lens. To be more specific, it’s made using tempered glass – the best. It’s very durable and tough, resistant to environmental damage and it’s designed with anti-fog technology. Made using 100% silicone, it’s very comfortable to wear, which is important, especially for extended diving sessions. The material is far superior to PVC (which can be found in lower-quality masks) and offers a nice, comfortable seal. The buckles add an even tighter, comfortable seal, giving you the protection you need when submerging. One of the downsides of buying this product is that you’re just getting the mask – snorkel not included. Now, this might not affect your decision for a number of reasons – maybe you already own one and just need a mask or maybe you enjoy the lower price because this is considerably lower in price when compared to the previously featured products. This wouldn’t be a real review if it wouldn’t feature a wide range of products. This time, we’re taking a look at the Speedo Adult Recreation Dive Mask. Speedo is another company that is very active in the watersports industry, producing goggles, fitness apparel and more. The Adult Recreation Dive Mask is an entry-level product – it’s either your budget pick or your first snorkeling mask. What’s nice about this mask is the price: it’s very low, twice as low as what we’ve seen so far. What’s not so nice is the quality of the parts. The visor is made using polycarbonate material – not as great as tempered glass. This means that it will get damaged easier and it might impair your vision because of this. The straps and skirts aren’t as comfortable as a more expensive mask, as you won’t be able to achieve such a good fit without suffering discomfort. This is also bought independently from a snorkel, so just go for it if you already own one. If not, we recommend buying a complete package. The Ocean Reef Aria Full Face Snorkel Mask might just be the best full face snorkel mask on our list. OceanReef is one of the industry leaders when it comes to snorkel masks, and it’s easy to understand why. 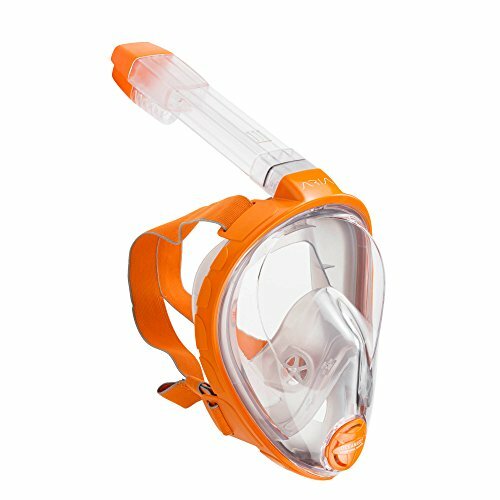 The Aria Full Face Snorkel Mask provides a beautiful, wide angle (similar to the Octobermoon snorkel mask) that allows you to breathe easily through your nose, as the full frontal part of the mask is watertight. The snorkel is designed to close when it comes in contact with to water, so you can breathe easily, without experiencing mini drowning incidents. The breathing circulation system is designed to minimize fogging, which is to be expected of a premium product such as this one. It comes in different sizes, to fit everyone, and the two back straps will safely keep it in place. Seeing as it’s a more expensive product, you’ll have to decide if it’s worth the extra cash. If you enjoy wider angles and more comfortable breathing and you’re willing to spend a bit of extra cash, then this is the best seaview full face snorkel mask out there. Cressi products just keep finding their way onto our list. That’s no coincidence, they’re all pretty solid choices. 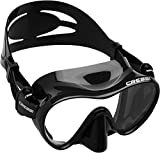 The Cressi Panoramic Wide View Mask provides users with a classic snorkeling experience but offers them a very quality product – the Tempered Glass lenses are great for giving the mask a big lifespan, as it’s a very durable material. The mask also has an uninterrupted field of view, great for exploring and enjoying the underwaters to the fullest. Other than that, it has standard stuff that you’ll find on any other snorkeling mask – adjustable straps and buckles to give you the perfect fit. 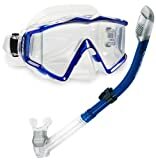 You’ll also receive a dry snorkel upon purchasing this, so you won’t have to worry about that – it’s a pretty good deal, as the bundle comes at a relatively cheap price. The only issues are with the size – it doesn’t fit people with smaller heads, especially smaller children. Many of us have prescription lenses, which can be a problem when practicing hobbies that demand you to wear visors and other types of lenses. The Optical Corrective Snorkeling Mask manufactured by Promate, a company that’s very active in the watersports industry, allows users to choose their prescription lenses prior to ordering. This is more of a niche pick, but it’s important to keep it fresh and provide options for every potential snorkeler. Optical Correction lenses are available from -1 to -10 by 0.5 increments and +1 to +4 by 0.5 increments. The available bifocal correction prescription lenses are: 1.0, +1.5, +1.75, +2.0, +2.25, +2.5, +2.75, +3.0, +3.5, +4.0./OP251. All in all, this is a great purchase for anyone who is suffering from impaired vision, and we strongly recommend users that need special attention to opt for this product for more safety and a better snorkeling experience. And if you’re thinking about price, well, these are cheaper than prescription glasses, so it’s a great deal. Watersports are a great hobby, but life support equipment is a serious matter and you should treat it with the importance it deserves. We feel that you now have a generous amount of products that will satisfy your personal needs.